Azmira Holistic Animal Care Grape Seed Extract is the most powerful antioxidant available from Nature! Contains 92% O.P.C's vs. only 85% O.P.C's as found in Pycnogenol's Pine Bark. Each capsule contains 50 mg. of the highest quality Grape Seed Extract with 50 mg. of beneficial bioflavonoids! Addresses tumors, reduces catabolic waste. 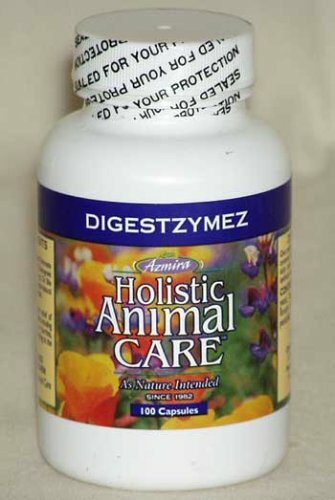 Azmira Holistic Animal Care D'Toxifier is used for supporting proper digestion, elimination, and nutrition or herbs to build the body's response. Use just a few drops at bedtime for an initial two weeks then once a week for maintenance. Can also be used as needed for temporary symptoms of imbalance including allergies, arthritic discomfort, urinary dysfunction and digestive upset. Azmira's D'Toxifier process benefits prevention and reversal of acute or chronic symptoms by reducing toxic waste in the body which is the cause of disease. This combination also promotes the use of available nutrients to fuel healing and long-term wellness. 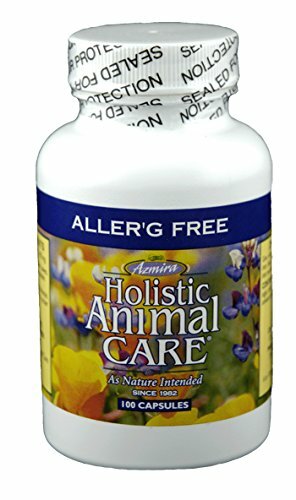 Azmira Holistic Animal Care Giardia & Parasitic D'Tox provides an excellent compound containing bitter principles, which activate digestive secretions and blood cleansing. Azmira Giardia & Parasitic D'Tox is strong acting upon a wide range of worms, amoebas and parasites, including heart worm. Can be used safely to clean out the colon, even with IBS, when parasites are the suspected trigger. This extract can also be used internally, as well as topically, to address parasitic fungal and yeast growth. 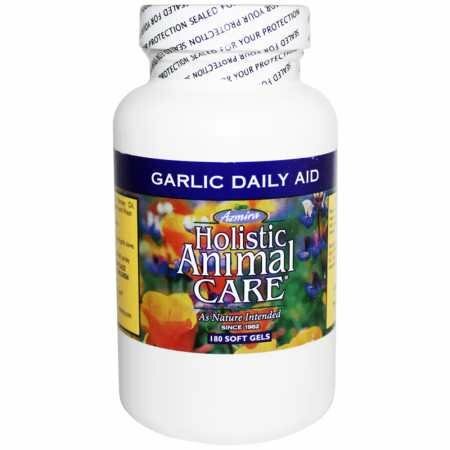 Azmira Holistic Animal Care Garlic Daily Aid uses one of nature's "miracle" nutrients, our pearls contain the strongest allicin content (1000 mg.) of only the freshest, pesticide free garlic, combined with 500 mg. parsley extract. Considered by veterinarians to target circulation, digestion and nerves; may purge toxins, stimulate the lymphatic system and immune system. 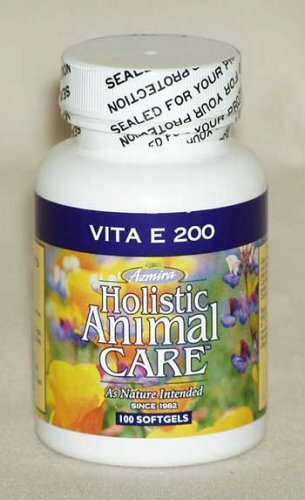 Azmira Holistic Animal Care Vita E 200 is a vital antioxidant and tissue healer. Vita E 200 also aids in cellular respiration, detoxification and repair. each gel cap provides 200 IUs of d-Alpha Tocopherol, the most potent form of vitamin E. Enhances oxygenation of blood, strengthens the heart, revitalizes, increases fertility, tones muscles and skin. Protects against radiation and protect B vitamins from rapid blood oxidation. Azmira Holistic Animal Care Yucca Intensive is an outstanding, proven safe, all natural supplement. Yucca contains steroidal saponins, which are nature's most powerful anti-inflammatory agents. Clinically proven to rapidly promote symptom relief similar to steroid medications, with none of the side-effects. Azmira Yucca Intensive is pure concentrated extract, not powdered waste product (the result of extraction process) as found in capsules or other popular bulk products. Standardized extract contains over 85% bio-available saponins versus only 3% to 7% left in waste powder. Yucca Intensive has the highest therapeutic steroidal benefits available and reduces pain as well as bute and aspirin without gastric side effects. *For arthritis, bone and joint problems, soft tissue swelling, digestive, bowel problems and colic. Tissue swelling reduces the blood flow through injured areas slowing recovery; toxins build up irritating the liver and kidneys. Yucca cleanses these organs, promotes blood flow and tissue repair, while preventing further degeneration and injured tissues. Reduces the "itch" of allergies, eliminating the need for steroid drug treatments. May reduce inflammation in brain areas responsible for seizure activity. Use topically for wound and hot spot treatment. Azmira Holistic Animal Care SeaSupreme is a vitamin and mineral powder for all animals, including horses, ferrets, rabbits, birds and reptiles. Contains 60 trace minerals, 19 essential minerals, 12 vitamins and 10 amino acids! From 16 types of sea vegetation (kelp is only one type of seaweed and limited in its mineral balance when used alone), includes blue green algae and spirulina. Naturally chelated for optimum assimilation. Tasty flavor can be used as an appetite stimulant when sprinkled on meals. For meat eating pets only. These capsulated enzymes can be fed orally or opened and mixed directly into food. Important support for pancreatic problems, irritable bowel syndrome, stress from traveling, show or during illness, whenever digestion may be compromised. Increases nutrient assimilation. 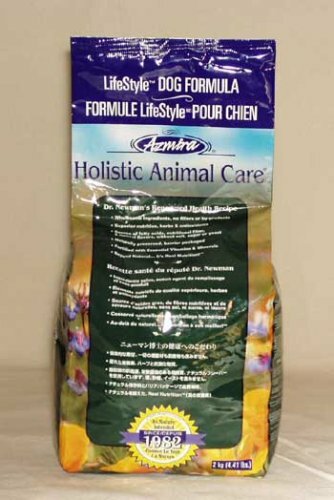 Azmira Holistic Animal Care D'Toxifier is used for supporting proper digestion, elimination and nutrition or herbs to build the body's response. Use just a few drops at bedtime for an initial two weeks then once a week for maintenance. Can also be used as needed for temporary symptoms of imbalance including allergies, arthritic discomfort, urinary dysfunction and digestive upset.Azmira's D'Toxifier process benefits prevention and reversal of acute or chronic symptoms by reducing toxic waste in the body which is the cause of disease. This combination also promotes the use of available nutrients to fuel healing and long term wellness. Ingredients:Arsenicum, Berberis, Iris, Thuja, Juniperus, Phytolacca, Solidago, Taraxacum, Ethanol. Joint Supplements, Yucca Intensive is an outstanding, safe, all natural supplement that is thought to promote symptom relief similar to steroid medications with none of the side effects. Yucca is a purified extract derived from the Yucca plant and has many uses including for the joints, skin, and digestion. Yucca is given internally for joint health and digestion but must be diluted before being administered. 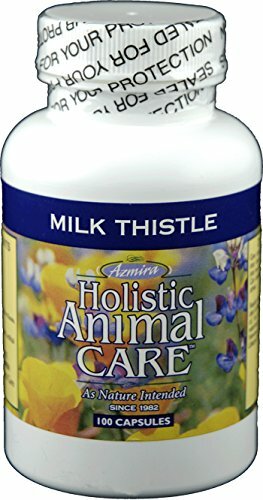 Azmira Holistic Animal Care's Milk Thistle Extract contains Milk Thistle Extract (175mg), Silymarin (140mg), Citrus Bioflavonoids (50mg), and Milk Thistle Powder (100mg).